You may recall from your GCSE studies that oxidation is loss of electrons and reduction is gain of electrons (OILRIG). You will also have learned how to write and balance simple half-equations to show oxidation and reduction processes. In addition, chemical reactions where one chemical species is oxidised and another reduced is an example of a redox reaction. A knowledge of oxidation states will allow you to determine whether a chemical species is being oxidised or reduced and the extent of the oxidation or reduction. All atoms, whether they are present in elements, compounds, ions or molecular ions have an oxidation state. It takes the form of a number that can be positive, negative or zero. If it is positive or negative, the sign must be clearly indicated. In simplistic terms, the number is determined by how tightly it is holding on to its electrons. It assumes that all chemical bonds are ionic, except for chemical bonds between atoms of the same element. Elements that are treated as monatomic in chemical equations are not chemically bonded to other elements for the purposes of oxidation state. They have neither lost nor gained electrons and are not sharing them with other atoms. Therefore, the atoms in monatomic elements have an oxidation state of zero. Diatomic elements exist as molecules consisting of two atoms covalently bonded to each other. As there is no difference in electronegativity between the two atoms, the shared pair of electrons is shared equally between the two atoms. Since neither atom has lost or gained electrons all the atoms in a diatomic molecule of an element have the oxidation state zero. Elemental ions have either lost or gained electrons compared with the starting atom. Ions that have lost electrons have positive oxidation states and ions that have gained electrons have negative oxidation states. The oxidation state of the ion is equivalent to the charge of the ion. This means that the overall oxidation state for the ionic compound is zero when the oxidation states of all the ions in the compound are added together. To determine the oxidation state of an atom in a covalently bonded molecule the bonds are treated as if they were ionic. This means that the more electronegative element has a negative oxidation number and the less electronegative element has a positive oxidation number. In a compound, the oxidation numbers of all the atoms must add up to zero. The same rules apply as for molecular compounds. The only difference is that the total of the individual oxidation numbers in the molecular ion must add up to the charge of the molecular ion. If you follow the rules listed below you should have no trouble determining the oxidation state of atoms and ions present in compounds. The oxidation states of the p block elements and transition metals vary. As long as you apply the rules from the table above you should have no trouble working out the oxidation state of these elements. 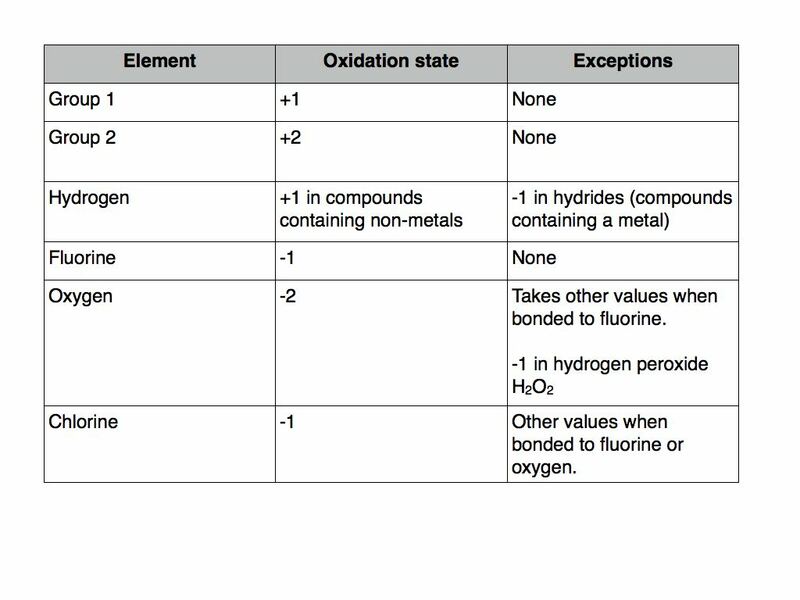 In my next blog post I will work through some examples of how to use the table above to determine oxidation state in a variety of situations. This entry was posted in A Level Chemistry. Bookmark the permalink.